Oh wow, back in print! (On black vinyl this time.) Again...Do not miss it if you didn't pick it up the last time it was repressed, or cop this to replace your old one! 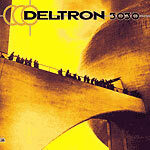 The concept album from 2000 pits Del's alter ego Deltron Zero in a futuristic backdrop in the fight against an oppressive world ruled by the major corporations of the universe. Dan the Automator, Kid Koala, and a bunch of guests including Mr. Lif, Damon Albarn, Prince Paul, Peanut Butter Wolf and Sean Lennon helped make this record the phenomenon that it is and contribute to the never ending confusion that is the difference between Del The Funky Homosapien and Deltron, from people who had never heard of Del until this came out.